With the 58’, Solaris confirms its leadership in custom and semi-custom yachts between 50’ and 80’ by producing real cruiser-racers designed by the best naval architects in the world. The historical and traditional quality of Solaris is exemplified with a jewel of rare quality in terms of construction and outstanding features and in terms of behavior at sea, that are characteristic of the hull lines by Soto Acebal. Particular attention has been given to the distribution of all the variable weights amidships, in order to maintain the ideal trim of the boat. 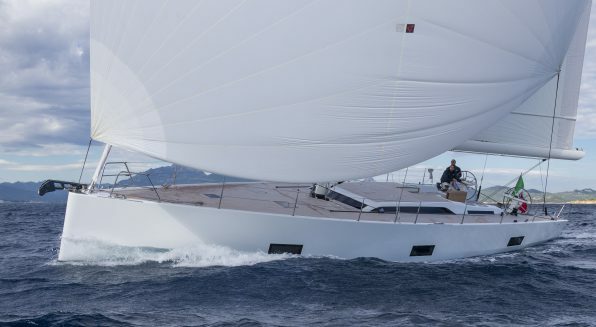 The high “chine”, a typical feature of Solaris hulls in recent years, has been designed to give more roundness to the shape of the stern sections with consequent reduction of drag. A moderately reverse bow has been incorporated to this design to provide a number of advantages while sailing such as improved wave penetration and less pitching. Halyards and sheets are lead to a bridge deck near the helm position to allow easy handling even when singlehanded. There are different options for interior layout to suit the customers’ requirements. A unique feature is the tender garage with longitudinal access, no need to remove the outboard engine, completely watertight and supported by a capstan winch for easy handling of the tender. More information on the SOLARIS 58 can be found here.